We are one of the leading manufacturers and exporters of Mineral Pulverizer/ mineral pulveriser in Mumbai, Maharashtra, India. We have an experience of more than 50 years in this Industry, We have our client all over the globe. Mineral Pulverizer offeredcomes backed by latest technology support and allows optimum processing support as demanded by the customers. Further, these pulverizing systems also allows for superior production capacity with advantage of low energy consumption. 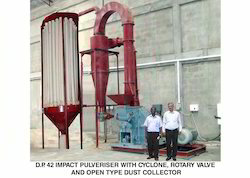 Some of its features include allows production of superfine powder to coarse powder; design modifications can also be done according to customers' suggestion; feeding of raw material controlled through frequency converter; allows for stable feeding; use of anti-wearing parts for lasting working; off-line clear dust in dust catcher; more efficient to clear dust. Looking for Mineral Pulverizer ?